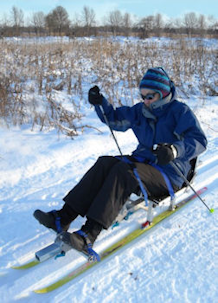 Jane Schmieding using one of the cross-country sit skis at Governor Nelson State Park. Jane has MS which restricts her ability to walk. Winter in Wisconsin is a difficult time for many people with disabilities; not only to enjoy the outdoors, but just to get around and complete simple tasks outside of the home due to snow. Our cross-country sit skis are an amazing opportunity for people with mobility impairments to get out into the peace and solitude of winter. The sit skis are available for free use at six locations listed below. All of these locations have flat groomed trails that allow for easier maneuverability. Come enjoy the outdoors year round! For individuals with mobility impairments, we now offer a unique way to experience the outdoors. Buckhorn, Council Grounds, Devil's Lake, Mirror Lake, and Perrot state parks all have kayaks available equipped with a number of adaptive devices. Most noticeable are the outriggers near the back of the kayak. Able to adjust to four different widths depending on the user's level of function, these provide incredible stability on the water. A raised back with side supports offer the user a comfortable and secure seat while paddling. Not only is this adjustable as well, but parts of it can be removed altogether for individuals with greater upper-body function. Lastly, the paddle is equipped with hand braces that make paddling easier for individuals with limited grip. These adapted kayaks are available just for people with disabilities. Whether you were a paddler prior to a disability or have never had an opportunity to get out on the water in a kayak due to physical limitations, we highly encourage you to get to one of these four state parks to give it a try. Former DNR Accessibility Coordinator Andy Janicki out for a paddle in the adapted kayak. Andy is a C5-6 quadriplegic. Many of our state parks with beaches feature different elements of accessibility on a normally inaccessible terrain. Some parks have specialized beach wheelchairs which have large inflatable tires that allow for easy rolling on sand and entry into the water. Others have laid down accessible beach trails that provide a solid surface for people in wheelchairs or those who have difficulty walking. Come get your feet wet! To provide a more comfortable overnight experience for disabled park visitors, there are nine accessible cabins in various Wisconsin state parks. There are rustic cabins located at Copper Falls and Blue Mound state parks as well as larger cabins with more amenities at Mirror Lake, Buckhorn, High Cliff, Kohler-Andrae, and Potawatomi state parks, Kettle Moraine State Forest-Southern Unit, and the Richard Bong State Recreation Area. These cabins are available only to people with disabilities and their guests and must be reserved ahead of time.